It is funny, sad at times and just downright weird at some parts, but it’s good in the eyes of the readers who can picture the story as though they lived it. 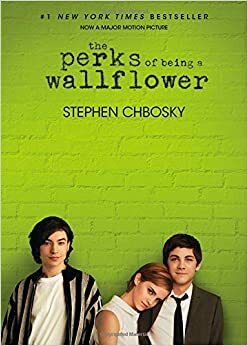 the perks of being a wallflower by Stephen Chbosky, is an amazing and somewhat-relatable book for teens. It is should be read by older ages because of its explicit content. Charlie’s story begins in an average town. Charlie’s life was never really dreadfully boring or fascinating, he was just an average person who didn’t do much. That is until he entered high school and was taken under the wings of two seniors, Patrick and Sam. They were exciting, lively, weird and, most of all, wallflowers. Wallflowers, they are the society of the unaccepted, the outcasts, the geeks and freaks. They are the kids that always go unnoticed in the background as if they weren’t there. The wallflowers are eyes and ears they hear, see, and notice what happens and accept it without being noticed themselves. Patrick and Sam had a group of good friends, of which they introduced to Charlie. The group of friends that they had were all just the people seen as the background to anyone else, but they ran life their own way. A little crazy, fun, and odd. After Sam and Patrick see the potential in Charlie they become great friends, they help him grow into a true wallflower. Even though, Sam, Patrick, and the others weren’t wallflowers, the understood Charlie. In one of the first parties with all of Sam and Patrick’s friends, Patrick talks with Bob, who owns The Cafe were they all hang out and is a friend of Patricks, says something that Charlie won’t ever forget, “He’s something, isn’t he?’ … ‘He’s a wallflower.” It was the first time that anyone ever fully labeled Charlie a wallflower. The perks of being a wallflower is written in a very original format. It is written as though Charlie is writing to someone unknown about how his life is going, so far. This technique works well because Charlie’s life is full of outstanding and understated memories, and having it split into letters shows the more important or interesting side of the story. I would only recommend this book to teens who enjoy to read about thoughts and experiences of others. Also because some of the content in The perks of being a wallflower should not be read by younger ages. Although it is a great novel for teens.